The aspirants of immigration and permanent residency in Canada like several things about Canada as a country, i.e. it’s ideal immigration policy, landscape beauty, social security benefits, offered job opportunities, living standards, and diversified culture, etc. However, in the last couple of years, one more feature about Canada is winning praises world over, i.e. it’s online, and Point-based Immigration System, i.e. federal Express Entry System. Express Entry system offers permanent residency visa to the successful applicants. It is based on a point system, wherein the candidates applying for Canadian Permanent Residency (PR) are judged and selected based on their points scored based on key aspects of their profiles, such as work experience, qualification, language Proficiency, age, etc. 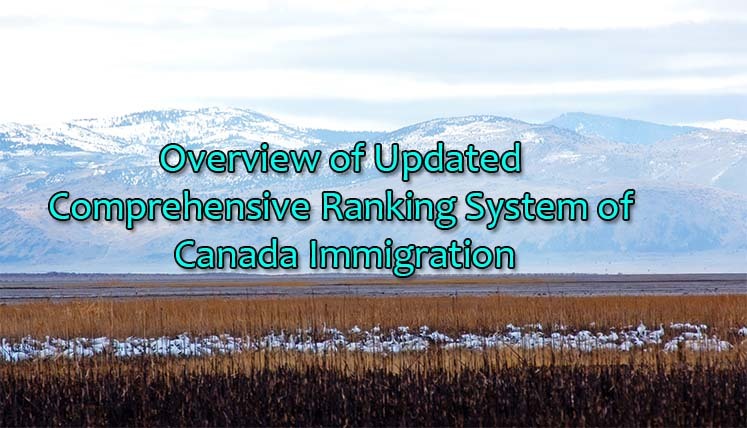 The point system of express entry is called Comprehensive Ranking System (CRS). Let’s find out more about the Comprehensive Ranking System of Canada to understand how the ITA (invitations to apply) is issued for Canada PR based on the same. As per the Comprehensive Ranking system, the points are allocated to the express entry applicants out of total 1200. These points are segregated by Immigration Refugee and Citizenship Canada (IRCC) in four key parts/sections, i.e. The section of CRS, points are given to a candidate based on his/her age, work experience, qualification, and language proficiency. The total points under this section are 500 points for individuals and 460 points if applying with a spouse or common-law partner. As the title suggests, point in this section given for the language skills, education and work experience of your spouse or common-law partner. Total of 40 points given under this section. The points under this section are given when the higher education of an applicant combines with his/her rich work experience enhancing his/her chances of getting employed and obtain higher wages in Canada. For instance, excellent language proficiency combines with the post-secondary degree or rich foreign/Canadian work experience. Total of 100 points allocated under this section. In November last year, slight changes have been made by IRCC in this section. The total points allocated in this section are 600 points. However, the full 600 points can be obtained only when you have got a provincial nomination certificate from any province in Canada. Moreover, if you have arranged employment offer from Canada, you can get 200 additional points under this section. A total of 30 points can be obtained under this section, if you have acquired post-secondary education in Canada. Need Assistance to apply for Express Entry System to get Canada PR? It’s the best time to apply for Canadian PR via express entry system in view of reduced qualifying marks or CRS Score requirement from Immigration Refugee and Citizenship Canada (IRCC). If you are interested in applying in express entry system, you must coordinate with a genuine and Best Immigration Consultants in Mumbai to understand completes details and apply for Canadian permanent residency under the guidance of a certified migration expert.